Yes, that's right, I was selected as one of the instructors at the Puget Sound Bead Festival this Summer. I will be teaching Gem Tree Sculptures. All in all it was a good day yesterday as I received this notice, plus I was asked by the Tenino Gem and Mineral Club to put on a Gem Tree presentation and demo in February and I sold 2 items off my 1000 Markets site. It was a good day. So, if you are wondering about the Bead Festival thing, here is a link to the Bead Festival web site that explains a little bit more about it although they don't have this Summer's list of instructors or classes up yet. I think they indicated it would be the first of March before that gets updated. So, now you are wondering what is a Gem Tree presentation and demo...well, I have no idea yet on the presentation, but I do demo's all the time, so the presentation part will be just explaining the various types of trees I make and techniques involved. If you want to know a little bit more about gem trees, I have a book and tutorials available for sale or you could check out my gem tree blog. And what were the items that sold yesterday, two pair of charm earrings. These are my most popular and my favorite to wear almost daily. I have several friends that would also swear by them. They come with multiple gemstone or pearl charms that you can mix or match. Fun earrings that go with most everything. Pictured is a set that is still available. 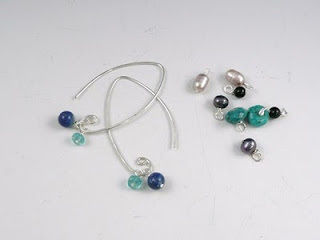 Charms include 2 sets of freshwater pearls, turquoise, black onyx, lapis and apatite. Click the word "Pictured" link above to take you to the product page. Here is hoping that we all have a great weekend.